Russian yachtsman, the holder of four prestigeous world yacht awards: the Medal for Seamanship and Tilman Medal of the Royal Cruising Club of the Great Britain and the Blue Water Medal of the Crusing Club of America and Fastnet Award Ireland Cruising Club. Member of the Russian Geographical Society. Cavalier of the Russian Order of Bravery. Nikolay Litau was born in 1955 in North Kazakstan. After serving in the Soviet Army moved to Moscow, worked as a driver and became a university graduate. At the age of 32 years came into yachting, took part in regattas and overseas trips. In 1992 received the diploma of a yacht captain. In the same year he was invited as a supervising captain to an English yacht «Wild Goose», that was the first foreign yacht to sail through the inner waterways from White sea into Black sea. Captain Litau is the author of the project to sail all four oceans of the planet on a sail yacht. 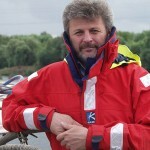 From 1993 to 1996 he managed the building of a yacht specially designed for these aims in the town of Tver. From 1996 to 1999 the crew of the yacht «Apostol Andrey» with captain Litau for the first time accomplished the sailing of the Northern Sea Route, and was the first one to sail round the world in the meridian direction. The Royal Cruising Club of the Great Britania called the navigation of «Apostol Andrey» an outstanding achievement of the worlds yachting in 1999. Captain Litau was awarded the Medal for Seamanship, that was once awarded to Sir Francis Chichester, Sir Robin Knox Johnston, Alain Bombard and other famous yachtsmen. In 2002 the Cruising Club of America awarded Nikolay Litau with The Blue Water Medal for the first navigation of the Northeast Passage on a yacht. In the autumn of 2001 the second round-the-world journey of «Apostol Andrey» around the western hemisphere took place. The route led from Saint-Petersburg through the Atlantic Ocean to the Antarctic, followed by the Pacific Ocean, shores of Alaska and the straights of the Canadian Arctic archipelago – the Northwest passage. By accomplishing the second journey «Apostol Andrey» marked a route, that was named as «Litaus Figure of Eight». As a result of two expeditions «Apostol Andrey» became one of three yachts in the world and first Russian acht, that sailed along the perimeter of the Arctic Ocean. In 2004 «Apostol Andrey» set off to sail around the world again. The aim of the third round-the world trip of the famous yacht was the most mysterious continent – the Antarctic. The crew of the yacht meant to sail around the continent without going north of the 60º S, which is the official border of this region. Two years after start the Antarctic circle was accomplished. In 10 years «Apostol Andrey» under the command of its captain left behind over 110 000 sea miles, being a guest at all continents of the planet, crossing all oceans and setting 5 new world records. In 2007 at the Moscow yachting festival captain Nikolay Litau was awarded the title «Legend of yachting». After completion his seventh Arctic navigation in 2013, Nikolay Litau had overcome the mark, Indicating 150 000 nautical miles passed under sail. 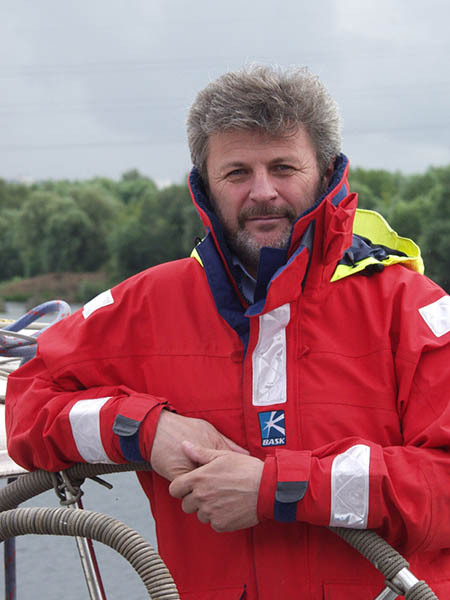 In 2016 Nikolay Litau was offered the post of a skipper of the yacht Northabout in the Polar Ocean Challenge Expedition. During four months and one day the yacht under the guidance of David Hempleman-Adams, the Leader of the Expedition, and Nikolay Litau sailed across the Northeast and the Northwest Passages, completing a circle around the perimeter of the Arctic Ocean. During this Expedition Nikolay Litau became the first yachtsman in the world, who managed twice to sail along the Extreme Arctic Circumpolar route. In March 2017 Nikolay Litau was awarded with the prestigious Tilman Medal by the Royal Cruising Club of the Great Britain for the «ten Arctic and three Antarctic Navigations». The Irish Cruising Club presented Nikolay Litau with the Fastnet Award for the Expedition on the Northabout yacht. Adventure Club, 5, Rusakovskaya str., Moscow, 107140, Russia. Reserve Band: 14.155; 14.165; 14.182,5; 14.190 MHz.